Today I have no confession, because I've been a good girl and have nothing to confess. Now that we're done with that crap, the real reason is that I haven't prepared anything for today, and I don't really have the kind of time it would take for me to make up something. I could explain about how recently I used more swear words in conversation than are heard at a trucker's convention, but that would be embarassing. But I'm not a total slacker, so instead I will leave you with a sneak peek of the picture we're using in our Christmas cards this year. Because we care enough to send the very best. I was trying out the Sock Bun and taking pics of myself for this blog. And then the kids got in the action. What a bunch of jerks. 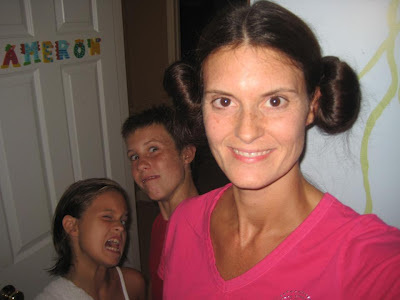 A fabulous nod to the fashion stylings of Princess Leia. May the Force (er, sock) be with you! I'm bringing this look back. Are you in?